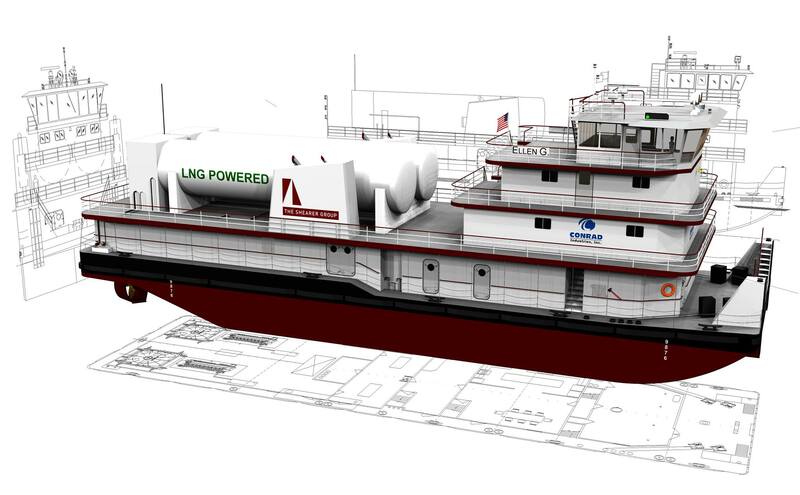 LNG POWERED TOWBOAT – The Shearer Group Inc.
Conrad Shipyard, LLC engaged The Shearer Group, Inc. (TSGI) to develop the design of an LNG powered towboat utilizing a proven design from TSGI. The team was awarded Approval in Principal (AiP) by ABS for the design of the 4,200 HP LNG towboat. The design is based on TSGI’s proven azimuth drive (z-drive) towboat design, eight of which have been built for Southern Towing Company since 2009. The original Southern Towing boats helped pioneer the use of z-drives for brown water operations and have shown significant fuel savings relative to conventional towboats. Further, this new LNG powered towboat design capitalizes on Wärtsilä’s proven dual fuel technology. By combining two widely accepted technologies; z-drive’s and Wärtsilä’s dual fuel engines and fuel system, most of the risks with being an early adopter of this technology have been mitigated.